One of the best restaurants in Epcot is found, not in the World Showcase, but instead in Future World. 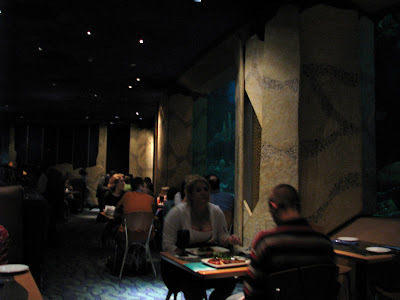 The Coral Reef Restaurant is actually part of The Seas With Nemo and Friends Pavilion. Although the restaurant has nothing to do with the Pixar film Finding Nemo, it does take full advantage of the location. The entire seating area shares a glass wall with the 5.7 million gallon salt water tank that is the showcase of the pavilion. This gives the diners a spectacular view to enjoy while they are eating. It is truly amazing to see the fish swimming by in this one of a kind restaurant. The Coral Reef does not live on the view alone, its food makes it one of the most highly sought after reservations in all of Disney World. Ranked #2 in the Only WDWorld Top 7 Disney Dining Plan Restaurants in Disney World, the Coral Reef specializes in seafood as well as steaks. The current dinner menu includes the following entrees: Seared Golden Tile Fish, Seared Rainbow Trout, Grilled Mahi Mahi, Pan-Seared Seasonal Catch, Seared Chicken Breast, Roasted Scottish Salmon, Wild Mushroom Lasagna, Grilled New York Strip, & Apricot Braised Beef Short Rib. The menu changes from time to time, but it is consistently one of the best restaurants to visit at Disney World that only takes one Disney Dining Plan Table Service Credit per person to eat there. The dessert menu also has my personal favorite: The Chocolate Wave. This is a flourless chocolate cake that is truly wonderful. The Bailey's and Jack Daniel's Mousse, as well as, the Butterscotch Creme Brulee are family favorites. The lighting and seating makes this an intimate feeling restaurant. Although it is fun to take your kids here to enjoy the view of the aquatic life, it also serves well for a romantic dinner for adults. Although I have occasionally seen mixed reviews for the quality of the food at Coral Reef, after more than a half dozen visits, my family and I have been consistently impressed with the food and we continue to list it near the top of our must visit restaurants each trip. The Coral Reef is considered a must visit restaurant at Disney World. Even if your family is not a big fan of seafood the atmosphere alone makes it worth the visit. If you are on the Disney Dining Plan then you definitely should have this on your list of restaurants to visit during your next trip. The great food, unique atmosphere, and strong Disney Dining Plan value all make it a must for your vacation. 1 comments to "Epcot's Coral Reef Restaurant Combines Fine Dining With A Unique Atmosphere"
The Coral Reef is my favorite places to eat in WDW. Good profile and great pics!